As a signal beacon for the New Year, the “Mule Barn” seems like a good choice, because it is part of the Turn Point Lighthouse complex on Stuart Island. But why are there quotes around “Mule Barn?” Because as far as we can tell it never housed a mule! 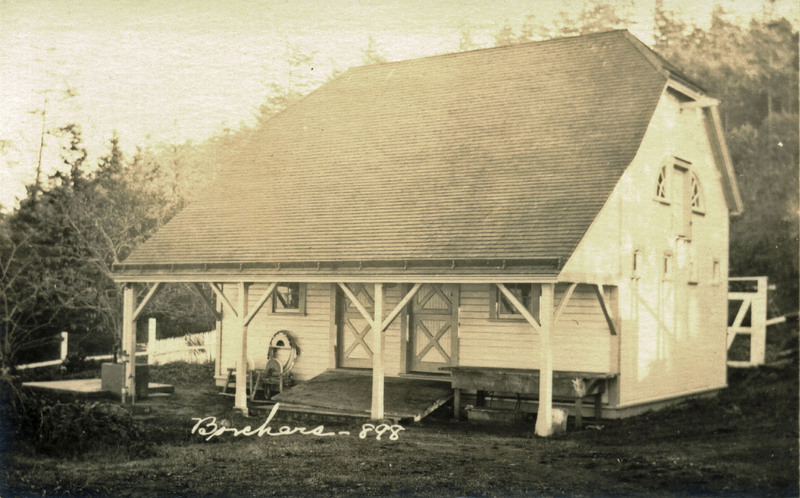 US Lighthouse Board Engineer Carl Leich (1854-1939) designed the barn, as part of the Turn Point Lighthouse complex, in 1893 and it was constructed the next year. He chose the Queen Anne Style, so the barn has a hip-on-gable roof, and features a lunette-style haymow with door and fanned window bays in each of the upper parts of the side elevations. The building measures 20′ wide by 30′ long; an open, 8′-deep verandah is located on the front elevation. Originally designed for mules, it contains three boxed stalls and a fourth bay for tack. But it was never used for mules, or any other animal, for that matter! 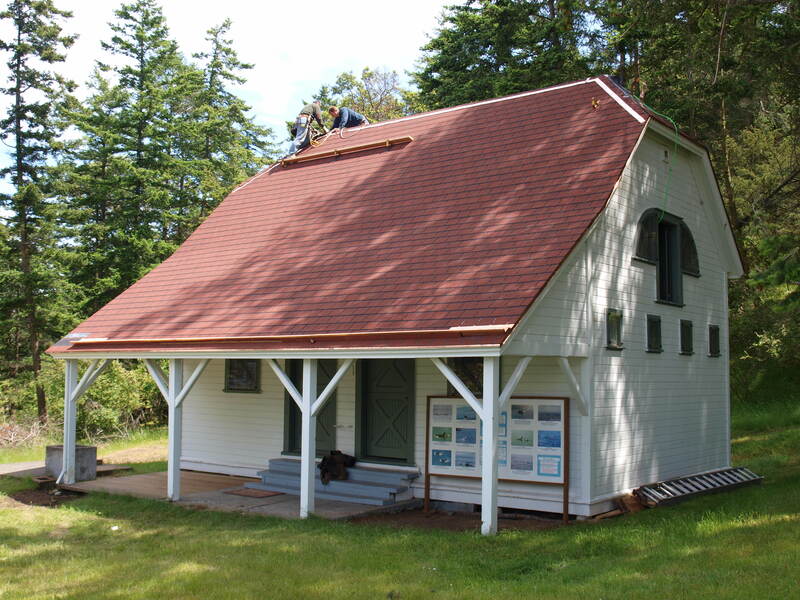 Instead, it was used for a workshop and storage and also housed the first Stuart Island school in 1897 before it moved closer to the center of the island the next year. 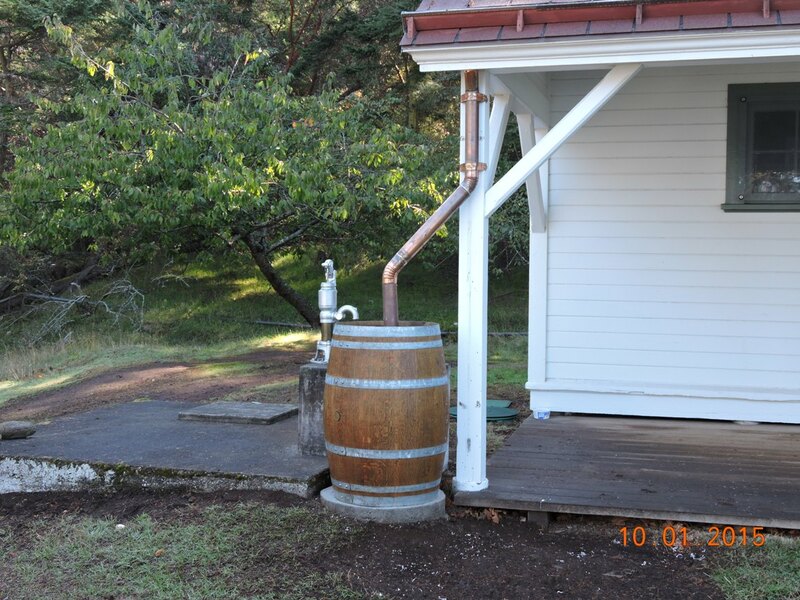 Both the Coast Guard and volunteers have restored the structure, including a cistern with pump. The building is currently used by the Turn Point Lighthouse Preservation Society, with a museum in one half and a theater for a movie about the history of Turn Point Lighthouse in the other. They welcome assistance in preserving all the important structures at Turn Point!